Tặng sim 3G chuyên dụng. The MC950D is a patent-pending mobile broadband USB modems optimized for Europe, Japan, North America and territories around the world which support the 2100 MHz band. No need for WiFi with this solution. These little guys provide a total mobile internet experience, with download rates of 7.2 Mbps and upload speeds of up to 2.1 Mbps worldwide* making it easier to access the Internet, your corporate network, email, and transfer files, music, pictures, and video from virtually anywhere. Ovation MC950D is designed to support various platforms, Windows, Mac, and Linux. 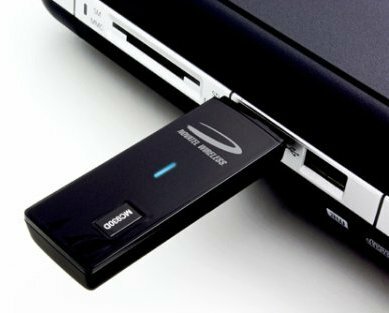 The USB form factor makes for a truly versatile device, as it is smaller and more widely available than a traditional PCMCIA card. With Ovation connectivity is on the fly! Unlike other competing devices, Ovation MC950D doesn't use an external battery. Get connected wherever, whenever, and for as long as you need; not as long as your battery will last. No costly battery replacements, no additional chargers to lug about in your baggage, no unnecessary stress. Ovation is designed to make your life easier, not give you another thing to worry about (or carry around). Mac users use the native Mac Internet Connect application in Tiger and Leopard. Just pop in the device and the Mac Driver Installer for Ovation automatically launches. The Mac User Guide for Ovation MC950D leads the user through an easy-to-use setup. Peak download speeds to 7.2 Mbps and upload speeds of 2.1 Mpbs for web surfing, email, VPNs, and more. Use in home, office, on the road - virtually anywhere for on the go mobility. Works in North America, Europe, Japan, and countries around the work in supported bands. Small compact USB mobile broadband data modem. Only 70 x 25 x 12 mm (L x W x H), suitable for home, office and when mobile. No installation - Mobilink™ Lite Connection Manager is pre-installed, flashed in the USB modem’s memory. Dashboard customization as well as multiple languages is also available. MobiLink™ Software Development Kit (SDK) can be used for integration of third party dashboards. *An account with a network operator is required. Speeds are network operator dependent.